In August 2016, I was fortunate to land an illustration contract with the Montreal Botanical Garden. 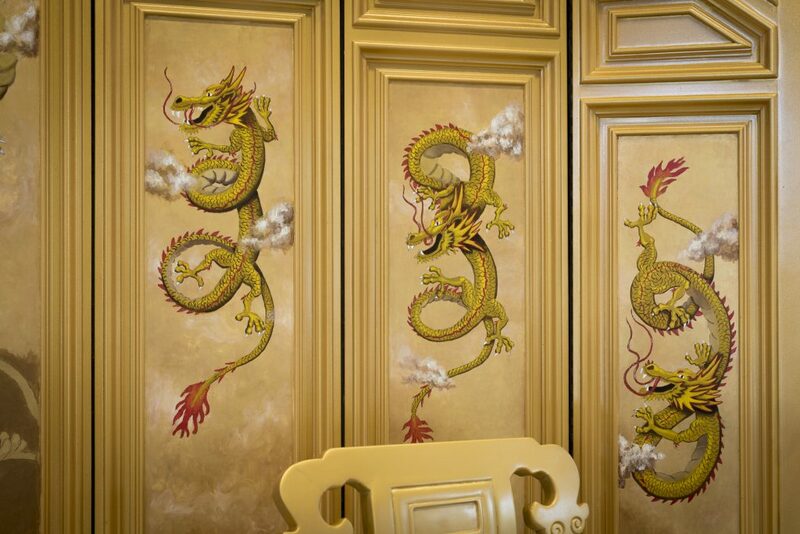 My task was to paint 7 dragons to decorate 7 panels behind a replica of the Chinese emperor’s throne. Considerable pressure was involved since it would the main attraction of the “Magic of Lanterns” event. 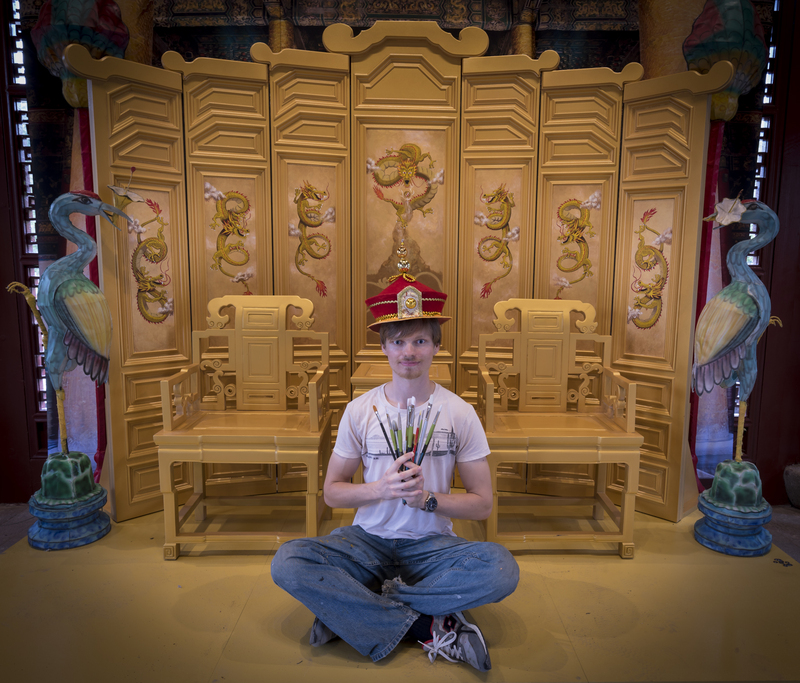 This project wasn’t about artistic freedom and reckless experimentation. It was rather about order and discipline. I was there 3-4 hours a day for three weeks, painting in the August heat. 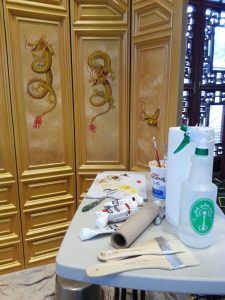 The Chinese garden was undergoing a complete makeover. The commotion of hammers, drills and mixers vibrated in the air. A dozen Chinese workers kept coming in and out of the pavilion to chat, eat and smoke during their breaks. Thanks to the complete Beatles’ discography, I succeeded in ignoring the sporadic hassle. Here’s a bit about the technical side of the project. I began with a simple pencil sketch to figure out how to place and twist the dragons. Then, I did 4 full-size pencil outline-drawings (1 for the central dragon, and one for each pair of side-dragons since they are basically mirror-reflexions). 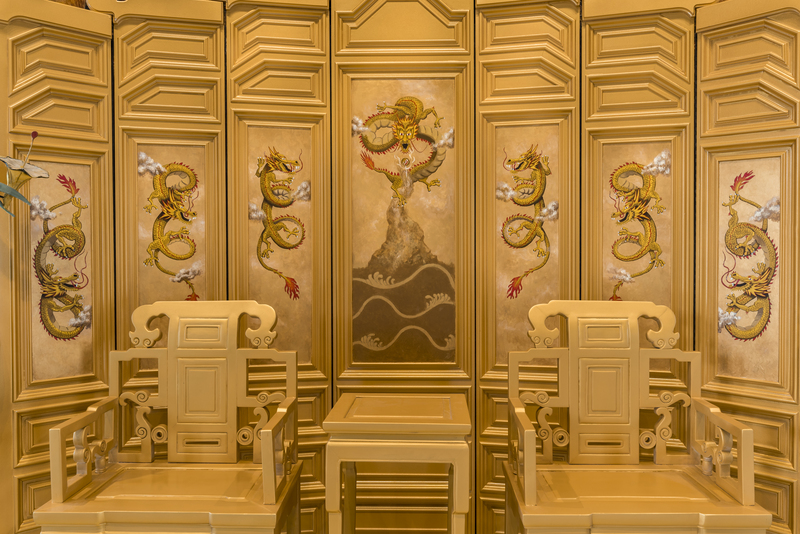 Then, I painted the golden background on the panels; transferred my drawings; and painted the dragons using a limited acrylic palette of titanium white, cadmium yellow, cadmium red and burnt umber. And, thus resumed a long forgotten relationship with my “frenemy”: Acrylics. As opposed to oil, they are quite transparent and they dry quickly. Now, the quick drying actually came in handy for this project. For example, I could paint a dragon’s yellow body and paint the scales on top without waiting more than a few minutes. But the transparency forced me to apply two or three layers where, in oil, one would have been enough. It took me at least 8 hours just to lay in the golden background on the panels. Even though the Beatles made at least 200 songs, their discography was barely sufficient to cocoon my mind as I piled on layers of paint. Ultimately, it was a great exercise in precision and patience. Clearly, it was a step out of my comfort zone and that is always beneficial. Special thanks to Émilie Cadieux and My Quynh who trusted me with this undertaking!